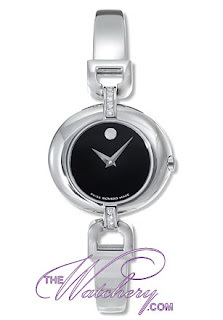 Movado means "always in motion." Does that not define exactly what we look for in a watch? After all, quality and dependability are not optional and does not change from consumer to consumer. This is something to consider first and foremost while you are shopping for a watch. The Watchery carries all the top brand names in watches. Brands that have a reputation for quality, dependability, and style. This is why I want to tell you about The Watchery Giveaway. If you purchase a watch that bears the giveaway icon, such as this sporty Movado mens Gentry . . .
. . . or this modern Movado womens Vivo bracelet watch, you will qualify to receive a watch free of charge! The value of the watch you may choose depends on which watch you decide to purchase. Please visit TheWatchery.com for any restrictions that may apply. In addition to Movado watches, this website carries all sought after brands guaranteed to put a smile on your loved one's face on their birthday, anniversary, Christmas morning, or any day. My husband, who could very well be the pickiest man on the earth when it comes to watches, names these as his favorite brands . . . Citizen, TAG Heuer, and Omega. 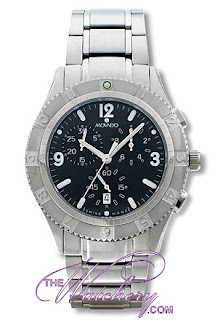 My taste draws me towards Kenneth Cole & Breitling mens and Gucci & Movado womens watches. The Watchery Giveaway is running for a limited time only. It is a great way to get a head start on your holiday shopping and cross 2, 4, or 6 people off your list. This deal will work out great if you have parents or two children to buy for or you can just gift one watch and keep the other one for yourself. That last idea sounds pretty good to me!